Custom built Villa completed in 2008 sits on the bluff of a hill over looking the beautiful bay of Tenacatita and is in the town of La Manzanilla. The villa has an access road and gated steps down to the town from the pool area, making La Manzanilla shops, cafes, restaurants and the local beach a five minute stroll away. 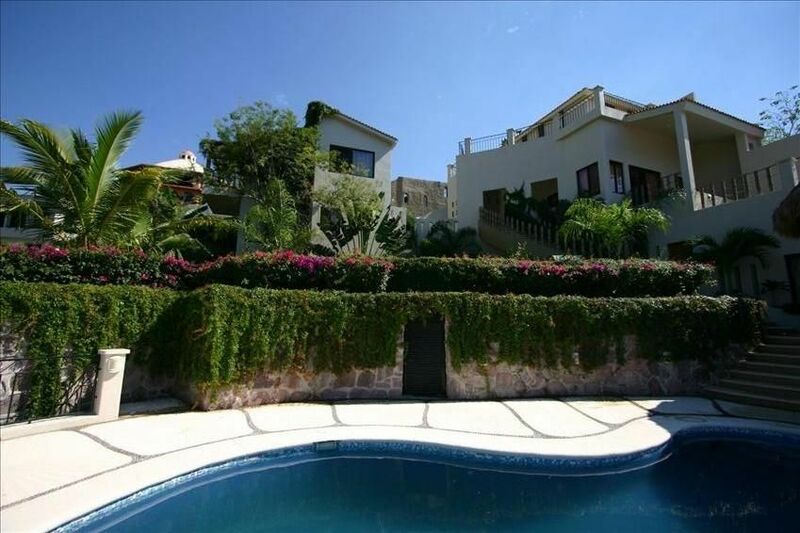 The villa has a total of five bedrooms, and four bathrooms. There are two master suites with walk in closets and separate master bathrooms. There are also three guest bedrooms; the large guest bedroom has a king size bed, and two single beds, and can sleep 4 comfortably. The other two bedrooms have two single beds in each and share a full bathroom. There is another full bathroom next to the large guest bedroom downstairs. There is a living room with an entertainment area next to the kitchen. The kitchen opens to an outdoor thatched palapa area that looks over the private swimming pool. The villa also has a shaded outdoor dining area that can accommodate 10 people comfortably. There is a large lawned area and a manicured garden that looks out over the ocean and has an unobstructed view of the sunsets. There is a private entrance to the villa with two car off street parking. A third parking spot in private garage can be arranged on request. The fishing village of La Manzanilla has all the amenities you will require including several shops, bars and restaurants. La Manzanilla has a long, curving, gently sloping beach with gentle surf extending for about a mile. Good swimming, diving. Numerous palapa restaurants line the beach. You can hire a local fisherman to go after Dorado, Sailfish, Tuna, and many other varieties of fish that frequent the bay. Wildlife observation is popular for Spotted Porpoises, Whales, Brown Pelicans, Cormorants, Brown-footed Boobies, Frigates, and many more varieties of animals. Next to the village is a Mexican Federal Ecological Zone ( a high tide mangrove lagoon), home to Egrets, Heron, King Fishers, Ibises, Anhingas, and Caimans (part of the crocodilian genus) plus several miles of shrouded waterways accessible with a local boat guide or on your own in a kayak. Playa La Manzanilla is a mellow, user friendly beach with small surf, excellent sand, and several mom & pop sand-floored palapa restaurants offering the catch of the day and a front row view of the Bay of Tenacatita. The town is so small that for the most part you can get around on foot. There are taxis available at the bus station on Calle Gómez Farías and at the central plaza in Melaque. Cars may be rented at the Manzanillo airport. There are currently two bedrooms with AC at Casa Golondrinas. All bedrooms, and living area have ceiling fans, and stand alone fans for extra cooling. This was our second stay at this amazing villa and, once again, we came away more than impressed. None of issues noted in the previous review affected us. There were no smells, no water issues and every time we contacted the property manager (Josefina's office is an easy 10 minute walk from the villa), she was quick to address the concerns we had (ran out of bottled water in the villa and we got more water a couple hours later). Hot water in the showers doesn't come right away, but if you run the shower for a bit, it'll come. The pool is amazing to have after the short climb up the hill from the beach. Its great to have AC in the main house, but as mentioned, the guest house doesn't have any. Not a big deal. We didn't see any of the maintenance-related issues that the previous review mentioned. The rooms were clean and the cleaning staff and gardeners were great to talk to as well. The pool furniture was clean as well. Yes, there are cockroaches on the pool deck, but its the outdoors in Mexico... not much you can do about that and we wouldn't expect it. We didn't use the kitchen to make food because there are so many great and cheap restaurants within a 10 minute walk in town that we just woke up and went down the hill. Yes, the TV is old, but we didn't turn it on once during the 10 days that we were there. The stereo is quite old, so if you'd like to play music by the pool, make sure to bring your own (we did). We had 12 people (late 20's/early 30's) staying at the Villa for 9 nights and found that there was more than enough space for all of us and it never felt crowded. Would definitely recommend this Villa for larger groups and we'll be back for sure! Thank you so much for your kind review, we are very happy to hear that your group enjoyed your second stay at Casa Golondrinas! We hope you will come back to La Manzanilla and stay with us again. Our family VERY recently stayed here. Casa Golondrinas is very beautiful and spacious. There are amazing views. Awesome bedrooms and a wonderful pool. With only a 5 minute walk to the town square, it's situated in the perfect location. Far enough from the noise but close enough for walking distance. Our family has been vacationing in La Manzanilla for the past 20 years and have stayed in many different rental properties. This review is not meant to be slander or a bad review, just honest. We did have a few issues with this home, the downstairs bathroom in the first building had a lot of issues. The shower head was not properly installed and sprays water ALL over the floor, this is something that we can look past however feel it should be pointed out. The bigger issue is the toilet. It leaks from the bottom, causing the whole bathrooms to stink as well as it does not flush the first time. This building does not have AC, once again not a big deal as well as there is no hot water in the showers or sinks. The water dispenser in this building also leaks very badly all down the stairs. The master sweet was great, however once again no hot water in the sinks or showers. We believe that the downstairs bedroom in the main building has mould in the closets because there is a musty smell in it, however, the bathroom closest to this bedroom is the ONLY one with hot water. In the kitchen, all of the light bulbs are burnt out as well as the center element on the stove only half works (it's propane making this unsafe). There are actually light bulbs burnt out all over this property. There is nowhere to store food besides the fridge and we had food and garbage was ransacked by animals. Those were the biggest issues, we had a few things that we thought should also be updated. THESE COMPLAINTS ARE ONLY BECAUSE OF THE PRICE! The TV is extremely old and the sound system barely works, the cushion covers on the couch have obviously not been washed, and there are no umbrellas by the pool. Sadly, we also had a lot of cockroaches in this home as well. We contacted the property manager, Josephina, with sadly no response from her. However, our messages may not have gone through, so no blame is being placed on her! The pool cleaners, cleaning ladies and the gardeners were awesome! However, if these things were changed we wools gladly return with even more family. The price at this time, was not worth what we were given. Wonderful place, just needs general maintanance! Owner and property managers are disappointed if guests experience issues at Casa Golondrinas, and sorry to receive this review. Part of visiting La Manzanilla is its rustic charm. Not everything works perfectly all the time. For this reason, guests are provided with property managers contact details and instructions to contact her with any problems. Property manager visited guests to check on the villa and to make sure they had her number. There is a working landline at the property if cell phones do not work. Guests didn’t contact property manager/owner, and passed by the property manager in town on several occasions. Property manager is good at helping with unexpected issues in a swift, unobtrusive way, as least likely to interrupt any guest’s stay. Plumbing/stove/light bulb problems could have been resolved by phone, or visit to property manager’s office, the location of which guests knew. The water dispenser was new, only required checking the seal on the tap. Secure trashcan would have been provided on communication about ransacking animals. Secure trashcan is now on-site, and doors on any previously open shelving. There are closed cupboards in the kitchen, shown in photographs, glassware stored in these could have been moved to open shelving to provide space for non-fridge food, inaccessible to any animals. We stayed here with two other families (6 adults, 6 kids) over Christmas and New Year's Eve. The house was perfect because everyone had their own space. I was able to put my 3 and 5 yo to bed in a quiet space, while the adults were able to hang in the open air palapa. Beds were very comfortable, house was clean and well maintained, outdoor dining table was perfect for group meals. The house has an amazing view of the ocean and sunset which was perfect for sitting in the shade and watching the kids in the pool or relaxing with a book. The kids loved the pool which was a daily highlight. Though it was an easy walk down to the beach and one of the many charming beachside restaurants. I would highly recommend for groups or families looking for a Mexican getaway. Thank you for your kind review. I am delighted to hear that you and your family enjoyed your stay at Casa Golondrinas, and I hope we can welcome you back again in the future. I have stayed here for three years in a row. This place is absolutely wonderful. Two houses beautifully furnished. Outdoor living room under the palapa, open air kitchen and dinning room. The view is breathtaking while you sit by the pool in comfy lounge chairs sipping blended fresh fruit adult bevies (their blender can take beating). The property is impeccably maintained with vibrant foliage. There is parking and decent cookware. The town is so safe and chill I can let my tween and his friends rome without a care (much safer than my neighborhood in San Francisco!). The owners are so accommodating and attentive and have a lovely liaison, Josephina, in town that is available for any needs, questions and will even exchange money for you! I can't wait to go back again next year. It's becoming a (very fancy) home away from home for my family. LOVE LOVE LOVE Casa Golondrinas and you will too! An exceptional Casa. Stayed 2 weeks in 2015. 8 family members, all opinionated, absolutely loved it. The pool, the rooms, bathrooms, palapa/kitchen/dining area beyond belief, views great, real Mexican village (no resorts no condos) folks who live in it gracious, kind, helpful and lots of grocery outlets and small family restaurants. Bottled water aplenty provided and our garburator issue attended to within a couple of hours. No one got sick and we ate everywhere. The gardener/handyman Genaro is an outstanding kind human being who will help you explore and enjoy to the fullest. Really a special place makes you realize how lucky you are to be able to go there. Suggestions: One: the appliances (stove, dishwasher, fridge) need attention. Gas stove some burners out, fridge cold but door ajar without using brace and dishwasher not working (though repair people scheduled by property manager) Small things compared to all the good. Perfect for large group. Thank you so much for your kind review, we are delighted that you and your family enjoyed staying at the villa and in La manzanilla, it truly is a special place! Please note that Mexican IVA (16%) and Jalisco lodging (3%) taxes are now applicable on rental properties. This means that $350 USD per night will incur $66.50 per night in taxes. PLEASE NOTE CASA GOLONDRINAS IS AVAILABLE FOR A MAXIMUM OF 12 GUESTS INCLUDING CHILDREN, THANK YOU. Check in time is 4pm without special agreement during reservation. Check out time is 11am without special agreement during reservation. These times are in place to allow for turn over of the villa for new guests, thank you.